June is in full flower now and as we ease, or in some tragic cases are swept into summer, things, by which I mean birdy things, are slowing down dramatically. When visiting your favorite birding haunts, be sure to have a plan or you’ll be doing more bug and butterfly watching than bird watching. That’s certainly the case over at Lenoir Preserve, where the American Painted Ladies are lovely indeed, with one notable exception. Once the migrants clear out and the local breeders get down to business, one little brown job with an outsized attitude rules the roost. How about those House Wrens? 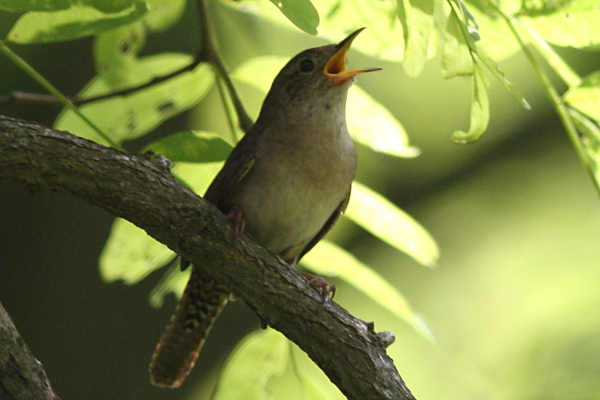 The House Wren (Troglodytes aedon) is a petite songbird, subtly barred in shades of brown, black, and gray. Their strong staccato song rings throughout the Americas just about anywhere birdhouses are mounted. In fact, this tiny troglodyte has such an extensive range throughout the New World that it’s broken into a variety of subspecies deemed in some taxonomies to be full species. My first encounter of the year was with a remarkably rufous Southern House Wren (T. aedon musculus) at the Hotel Villa Maya in Guatemala but my best views have all been of the T. aedon ardon group here in New York. If you find yourself with the Pacific to your west, the Atlantic to your east, and the equator to your south this month, listen for that clear, ebullient tune and get yourself a good look at great bird! They have been pretty active in my neighborhood since May. What’s in a Name: What’s in a Baby Name? Fledgling House Wrens are Fun to Watch!